We've found Boston's best dog friendly spots for a day of doggie excitement. Whether you're hungry, sleepy, or playful, there's no reason to hand over your doggie to relatives or a boarding kennel when you're in Boston. Pawsh Dog Boutique - Boston, MA - Pawsh is a chic Back Bay boutique offering a variety of healthy, practical and fun options for dogs and their owners. Sample the latest and greatest dog collars, stylish apparel, luxurious spa products, fun toys, and tasty treats. Pet Shop Girls - Boston, MA - At The Pet Shop Girls, we believe that a healthy pet has a much better chance of staying healthy through proper nutrition. For this reason, we have carefully selected the variety of foods and treats we sell to provide the highest quality diet available. Pet Shop Girls is the spot to keep your dog or cat, healthy and vibraten. We carry a wide variety of vitamins & supplements for your pet. Prima Donna - Boston, MA - Not just dog-friendly, this boutique caters to canines with a wide selection of doggie clothing, including Patriots and Red Sox jackets. The owner, Debra Mattaliano, carries clothes for humans, too, and often has her own dog, Olive, in the store. Brookline Booksmith - Brookline, MA - This Coolidge Corner staple is a favorite of locals looking for quality used books at a good price. The staff here is happy to have dogs in the store and is known to keep a bagful of treats behind the register. You might also find a bowl of water by the door on warm days. Louis Boston - Boston, MA - If you're shopping at this ultra-hip clothing store/salon/cafe, you probably have the cash to hire someone to watch your bichon frise while you're out. Louis Boston caters to people who are used to being pampered, and that apparently extends to their dogs. Flour Bakery & Cafe - Boston, MA - Thin-crust pizzas and crazy-good cookies and cakes, Flour is a regular stop on the neighborhood circuit for dog owners and their friends. The staff has even been known to drop a cookie or two on the floor when dogs are around. Taberna de Haro - Brookline, MA - The owners of this dog friendly Spanish spot gladly allow dogs on leashes at the outdoor tables. The tapas-based menu has plenty of small plates that doggies might enjoy sharing, too. Panifico - Boston, MA - A combination cafe, bakery, and sit-down restaurant, Panificio is known for its affordable food, such as monster sandwiches or big omelets stuffed with tomato, spinach, and feta cheese. 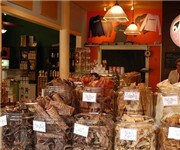 The portions are healthy, and city-dwelling dog owners report that the staff is quite dog-friendly. 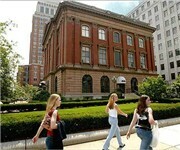 Tremont 647 - Boston, MA - This upscale eatery is the place to be seen with your canine. If you're feeling adventurous, roll out of bed on Saturday or Sunday and hit the pajama brunch. Dogs are welcome on the patio (which is the best place to be seen anyway), and the brunch menu has loads of dog-friendly treats. The Globe Bar and Cafe - Boston, MA - The Globe's large patio is often populated by nearly as many dogs as people. The staff leaves a bowl of water out for its four-legged customers and considers them a vital part of the business. Peter's Park Dog Run - Boston, MA - Peter's Park is of the only off-leash dog parks in Boston, the Joe Wex Dog Recreation Space in Peters Park is located in the South End on Washington Street between East Berkley and Waltham Street. This completely privately funded dog run, opened in 2007, is a true expression of Bostonians love for their four-legged friends. Danehy Park Dog Run - Boston, MA - The park encompasses 50 acres near Fresh Pond. There is a designated off-leash area located within the park. However, the local dog owners group has complained that the area isn't fenced in and gets muddy very easily. Fresh Pond Reservation Dog Area - Cambridge, MA - Only dogs licensed in Cambridge are allowed off leash. The area is policed by park rangers who routinely check dog IDs and hand out fines to unlicensed Cambridge pets or unleashed out-of-city dogs. Dog owners may use the trails if their dog is leashed. Fort Washington Park Dog Run - Cambridge, MA - The fenced-in park is completely off-leash, although dogs must still be under voice control. Though dominated by an open lawn, dogs can also enjoy the shade trees. 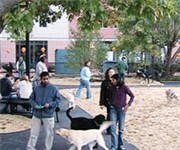 Pacific Street Dog Park - Boston, MA - The dog run is completely fenced-in with a vestibule gate for safety. Dog owners are legally allowed to let their dog's off-leash, but animals must be under voice control. 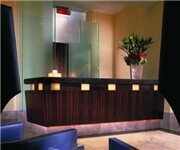 Nine Zero Hotel - Boston, MA - Nine Zero Hotel Keeps You Out of the Doghouse. Nine Zero Hotel, a dog-friendly Boston hotel right in the heart of downtown, makes certain you won't have to leave your favorite friend at home. Complimentary to all our four-legged guests, our "IN the Doghouse" pet package includes Nine Zero pet bowls and a dog bed placed in your room for use throughout your stay, dog sitting, dog grooming, dog walking and pet massage services available through our concierge. Hotel Marlowe Kimpton Hotel - Boston, MA - Hotel Marlowe takes "Pet Friendly Hotel" to a new level. A lunch box full of yummy complimentary treats is given to pets that have stayed at the Hotel Marlowe five times or more and to our VIP (Very Important Pets). This amenity is available for both cats and dogs. If it's your pet's birthday, we will be happy to order your furry friend a birthday cake from the Hotel Marlowe's preferred dog treat shop, Polka Dog Bakery. Hotel Commonwealth - Boston, MA - Hotel Commonwealth is proud to be a pet friendly hotel in Boston, and we provide luxury accommodations to our guests who are traveling with their four legged friends. •Complimentary use of pet bowls and a pet bed placed in your room for use throughout your stay. •Pet sitting, pet grooming, pet walking and pet massage services available through our concierge. Seaport Hotel - Boston, MA - Seaport is delighted to welcome your pet as long as it occupies the same room as its owner, weighs less than 50 pounds (23 kilograms) and is not left in the guest room unsupervised. The Onyx Hotel Kimpton Hotel - Boston, MA - Animal lovers have always known what scientific researchers now confirm: Animals are good for your health. According to a number of studies, just ten minutes of physical interaction with a beloved pet can lower your blood pressure and increase finger temperature, both signs of relaxation. When staying at the Onyx Hotel in downtown Boston, you can relax: We invite you to share our luxurious Kimpton boutique hotel with your best animal friend. A unique and truly pet-friendly hotel, Onyx Hotel takes care of all our guests in style, so bring your pet with you. The Ritz-Carlton Boston Common - Boston, MA - The Ritz-Carlton welcomes dogs and other pets up to sixty pounds to stay with them as well. The Pampered Pet program caters to the entire family...including those loved ones with four legs. The Pampered Pet package includes Ritz-Carlton doggy biscuits, keepsake pet food bowl and custom dog tag and pampering spa treatment for your dog.